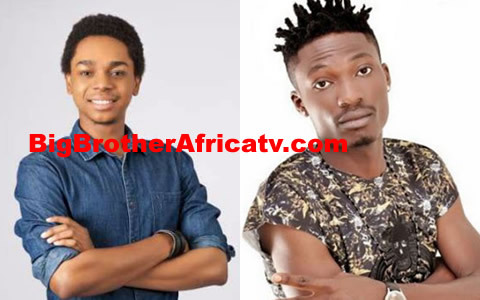 Big Brother Africa 2019 | Season 10 Housemates, News, Contestants, Live Stream, Polls, Nominations: Miyonse Shades Efe: "BBNaija Is Not A Poverty Alleviation Scheme"
Miyonse Shades Efe: "BBNaija Is Not A Poverty Alleviation Scheme"
So bbnaija is a talent show now abi? Or efe is from the majority state that's why he's getting the highest votes cos of tribalism...make una dey use una kidney reason abeg..
Its not a talent show..it has many dynamics ..otherwise there would not be things like the one campaign which is directed at the well-being of a human...of course it is abt boosting the potential of the housemates, some are into music, some into aliviating poverty and on and on..you need a certain kind of person to take that responsibility! That is why it is left to the public..so if the public likes Efe, one cannot undermine that! May be he is favoured because people relate to what he is standing for. Because if you are good at acting or singing for that matter, how will that improve my situation because u r doing it for yourself not for me... thsoe are the dynamics that people forget abt and Efe brought that to the peoples attention very well!! All are destinies were written by God Almighty,he is the only one who can change that we only control our destinies.The winner of the BigBrother 25Million naira has already been decided by God Almighty nobody can change that.I love all the housemates they all have their flaws but only the chosen one will win good luck to all of them. "IN GOD ONLY WE TRUST"keep voting for your favourite stop insulting each other. Miyonse,I will also advise you to go get a life.If you had remembered the society you cam from you won't have preferred breast to your career.When you make money women will follow you. Efe is likable and there's nothing you can do about that. Bisola a mother has done worse in the house to be hated. All supporters of Tboss and Bisola are same temp and tempest. TTT you are a back stabber Efe did you well and you paid him back with evil.Today you have been booted out. 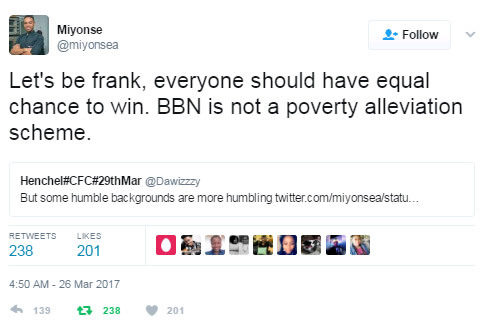 Bassey you were always nominating Efe but his God punished you as you were also booted out. looking back at the arrogance displayed by Efe supporters in the past weeks, i laugh when People now say Big brother is favoring Tboss. this is either plain stupid or living in a dream world. The popularity of Tboss is clearly down to Efe supporters. They exhibit so much biasness and hatred for Tboss that they are generating sympathy from people towards her. Efe supporters keep saying that Tboss is dull and not entertaining and so should be evicted, if that is the criteria for remaining in the house how comes this same supporters did not vote for TTT or even Bassie, Soma etc.? At least triple T is far more entertaining, talented and brilliant than their idol Efe. Many people see a lot of hypocrisy in Efe supporters and so will vote for Tboss just to annoy the Efe people.